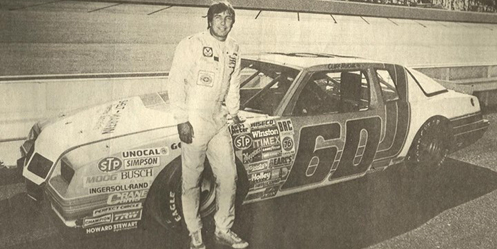 On July 20, 1986, Cliff Hucul picked up the 1st last-place finish of his NASCAR Winston Cup Series career in the Summer 500 at the Pocono International Raceway when his #60 Vernon & Sons Pontiac fell out with a broken clutch after 2 of the race’s 150 laps. The finish came in Hucul’s series debut. The Canadian racer, born in Prince George, British Columbia, began his career in open-wheel competition. He began running B-modifieds in 1967, made his way to the A-modifieds in 1968, then jumped to the Candian-American Modified Racing Association (CAMRA). In September 1975, Hucul claimed the track record at his home track, the three-eighths-mile PGARA Speedway. Back then, Hucul drove a Super Modified that was once driven by four-time USAC champion and 1983 Indianapolis 500 winner Tom Sneva, whose younger brother Jerry won the CAMRA title in 1974. While Hucul fell short of the ’75 CAMRA title, he soon eyed his own move to USAC, and a bid at the Indianapolis 500. Running as a part-owner-driver, Hucul made his USAC Champ Car Series debut on March 6, 1977 at the Ontario Motor Speedway, where he finished 12th of 26 starters in an event won by A.J. Foyt. He then qualified for his first Indianapolis 500 that May, becoming the third Canadian to do so, and finished 22nd with rear end trouble (that same day, Tom Sneva finished runner-up to A.J. Foyt). Hucul’s first Top 10 came the following year at Phoenix, and while he picked up sponsorship from Wendy’s Hamburgers (in what was called the “Hot-N-Juicy Special”), a busted oil line left him last in his second Indy 500. His best open-wheel finish came at the Texas World Speedway on April 8, 1979, when he ran 4th in yet another race won by Foyt. His third and final Indy 500 start came that May, where a dropped valve left him 29th. In 1986, Hucul hadn’t competed on the national tour in five seasons when the opportunity came to try his hand at NASCAR. Team owner Bobby Eller started his own Winston Cup team, and can be credited with bringing Kodak Film into the sport as the team’s primary sponsor. Eller signed journeyman driver Eddie Bierschwale from D.K Ulrich’s team, but the #94 Pontiac struggled to make the field. By June, Kodak had left the team and signed with Morgan-McClure Motorsports, with whom they would remain through 2003. With Bierschwale looking for other opportunities, Eller brought on Hucul for a four-race stretch that summer. With the yellow car #94 renumbered #60 and carrying sponsorship from Texan tire supplier Vernon & Sons, Hucul was set to make his Cup debut at Pocono. Hucul had made two Pocono starts in USAC, finishing 17th in 1978 and 11th in 1979. Still, the #60 Pontiac proved just fast enough to make the field, securing the 40th and final starting spot. Three drivers were sent home after time trials. Veteran owner-driver Rick Newsom made what turned out to be his final Cup Series attempt, following a 14-year career in which he made 82 starts. Corona, New York driver George Wiltshire in his #39 Oldsmobile had been attempting Cup races since 1968, but would turn his team’s attention to ARCA two years later. Also missing the cut was Pennsylvania’s Ferdin Wallace, driving James Hylton’s #49, who made his own final Cup attempt after failing to qualify for that year’s Daytona 500. Hylton’s primary car, qualified by modified racer Jerry Cranmer, put the #48 Fleet Service Chevrolet 26th on the grid. Much like last August, heavy fog interfered with the 500-miler at Pocono. This time, the start was delayed until the spotters could see the back half of the track. As the ceiling lifted, the green flag dropped, but Hucul exited under green just two laps into the event. Finishing 39th was Jocko Maggiacomo, whose #34 WMGC-TV Oldsmobile was owned by current Truck Series team owner Jim Rosenblum. That race marked the only time in Maggiacomo’s 12-year career that he didn’t run car #63. 38th went to Joe Ruttman, who crashed his #26 Quaker State Buick in Turn 3, drawing the first of seven cautions. Phil Parsons was next to fall out after his #66 Skoal Oldsmobile suffered ignition failure short of halfway. Rounding out the Bottom Five was veteran Buddy Baker, whose #88 Crisco Oldsmobile lost oil pressure after 98 laps. With the fog delay and rain on its way, the race was shortened to 150 of 200 scheduled laps. Tim Richmond recovered from a spin with Richard Petty that resulted in left-front damage to his #25 Folgers Chevrolet to find himself out front on the final lap. Racing side-by-side with teammate Geoffrey Bodine, both cars were in a dead heat coming down the frontstretch when Ricky Rudd caught them both and made a move to the inside. At the line, Richmond nipped Rudd by five-hundredths of a second, dropping Bodine to third. After Pocono, Hucul made just one more Cup start, starting 30th in the 40-car field at Dover that September. Unfortunately, a mid-race accident damaged the right-front corner of his #60, leaving him 31st. He made two other attempts at Michigan and the season finale at Atlanta, but missed both times. Bobby Eller’s team didn’t return in 1987, and with that, Hucul’s brief Cup career was done. Today, Hucul lives on a farm in his native British Columbia, where he’s recovering from a traffic accident that left him in a wheelchair. Reports indicate he is still active in racing, and is helping with the career of second-generation driver Richie Larson. *This was the first last-place finish for car #60 in a Cup Series race since May 29, 1977, when Ramo Stott’s Chevrolet lost oil pressure after 3 laps of the Coca-Cola 600. The number would not finish last again until March 26, 2000, when the engine on Ted Musgrave’s #60 Power Team Chevrolet let go after 22 laps of the Food City 500 at Bristol. As of this writing, Hucul’s finish is the only one for car #60 in a Cup race at Pocono. *Hucul is one of a handful of drivers to finish last in both a NASCAR Cup Series race and the Indianapolis 500. Among those joining Hucul are Tony Stewart, Chet Fillip, Larry Foyt, and Juan Pablo Montoya. *Peters, Jason. “Years of thunder: PGARA celebrates six decades of speed,” Prince George Citizen, May 12, 2012.